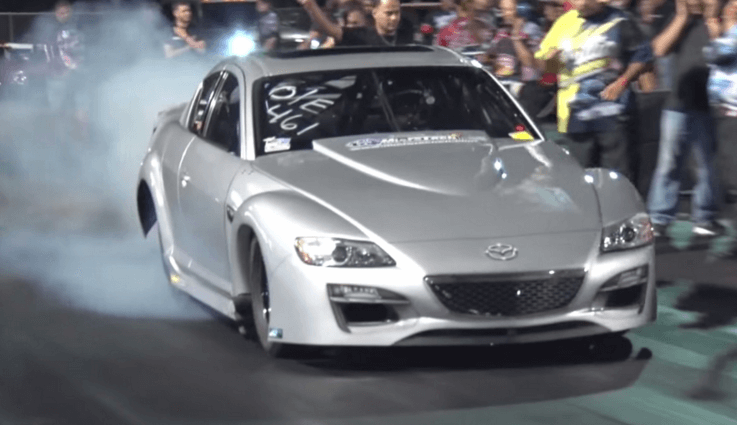 1600HP TRIPLE Turbo Mazda RX-8 makes us feel sorry for the drag strip! Meet this Mazda RX-8 with three-rotor, tri-turbo setup that is capable of doing tons of things at the drag strip. Obviously, this Mazda is a notorious ride that has come a long way, considering its standard form. The front end has been expanded thanks to tons of engine work which in addition, makes people curious about the performance it packs when they see that nose. However, that’s only a part of its changing. The car has been completely re-worked; the visual clues talk about the extra power and it’s completely clear that the suspension job alone must have required an unimaginable amount of work. After all the work comes the fun part. The RX-8 puts out 1600HP and is difficult, if not impossible to gain full control over it, when it reaches those numbers. Then, there’s something else to it- the sound. It’s like nothing you’ve heard before- a mix between a chainsaw and a shotgun is the closest that we can come, words only. Seriously, it should have an ear plug dispenser attached; the aural assault is not something that everybody can take in! This Is Insane – Kawasaki Z750 Stunt Gone Wrong!! Roland Sands Design Unique Take On The Ducati Diavel KH9! Bounty Hunter’s new record: 200ft in 2.006 Seconds, on dirt! Trike Rat Rod A.K.A The Asphalt Destroyer!